“It’s not easy to solve a problem left unsolved for more than 70 years after the war ended, but we must do that,” the Japanese prime minister said. 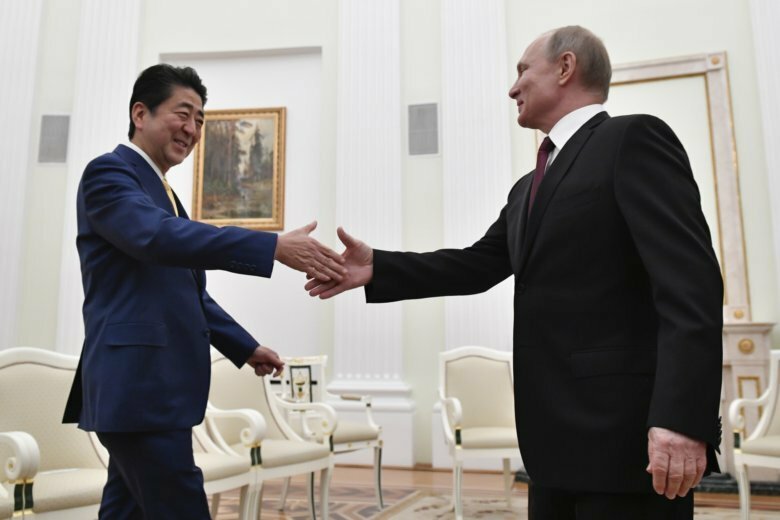 Earlier this month, the Japanese leader voiced hope that this year would mark a breakthrough in talks and spoke about an imminent change of the islands’ status — remarks that irked the Kremlin. Russian Foreign Minister Sergey Lavrov warned Japan last week that it must recognize all four islands as part of Russia as a starting point for talks — a demand that didn’t bode well for Abe’s hopes for a quick deal. The Kremlin foreign affairs adviser Yuri Ushakov also noted that recent statements from Tokyo made the talks between the two presidents even more difficult. Japanese Foreign Ministry spokesman Takeshi Osuga declined to comment on whether the atmosphere at Tuesday’s talks was troubled by Russia’s criticisms. But he portrayed the frequency of Putin-Abe contacts as a favorable sign. Speaking after Tuesday’s negotiations, Putin reaffirmed that Russia is interested in negotiating a peace treaty, adding that the 1956 Soviet declaration prioritized signing the document. He noted that they agreed that a charter flight to the islands will be organized in the summer to allow Japanese to visit their ancestors’ graves.